Corporate America increasingly relies on social intranets to leverage employees’ knowledge and foster collaboration in ways that speed up work and reduce costs. 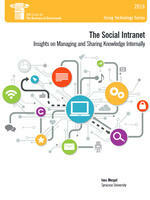 “Social intranets,” Dr. Mergel writes, “are in-house social networks that use technologies – such as automated newsfeeds, wikis, chats, or blogs – to create engagement opportunities among employees.” They also include the use of internal profile pages that help people identify expertise and interest (similar to Facebook or LinkedIn profiles), and that are used in combination with other social Intranet tools such as on-line communities or newsfeeds. The report documents four case studies of government use of social intranets – two federal government agencies (the Department of State and the National Aeronautics and Space Administration) and two cross-agency networks (the U.S. Intelligence Community and the Government of Canada). The author observes: “Most enterprise social networking platforms fail,” but identifies what causes these failures and how successful social intranet initiatives can avoid that fate and thrive. She offers a series of insights for successfully implementing social intranets in the public sector, based on her observations and case studies.